Perfect roundness and uniform hardness: The new seamless table tennis balls TIBHAR *** 40+ SL offer an absolutely uniform feel. Note: The product version '77211200' is available again shortly. 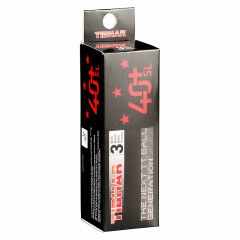 Tibhar Ball ***40+ SL (seamless) 3er white is beeing added to cart.